Long web copy This new edition of Essential Economics for Business presents the core principles of microeconomics and macroeconomics applied to the world of business while also looking at wider, topical business issues, such as business strategy, corporate social responsibility, ethics and the state of the global environment in which we live. Using up-to-date case studies the 5th edition examines everything from the impact of the financial crisis, to the effects of the Brexit vote in the UK, to popular distrust of globalisation, to the operation of specific businesses to illustrate how economic theory relates to real business issues. Looking for economics in action? Search online for the Sloman Economics News Site, a blog that's updated several times a week with current affairs and topical stories, all linked to your textbook so you can explore the background to the issues more deeply. 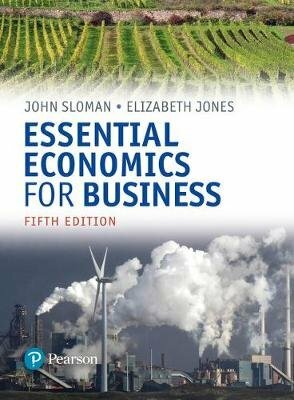 Authors bio John Sloman was Director of the Economics Network from its foundation in 1999 until 2012, and is now Visiting Fellow at the University of Bristol where the Network is based. John is also Visiting Professor at the University of the West of England, Bristol. Elizabeth Jones is a Principal Teaching Fellow and the Dean of Students in the Economics Department at the University of Warwick. Elizabeth is also a Lecturer on economics courses for non-economists delivered to departments across the UK government.